The visit will be the Indian premier’s first to Iran since last year’s nuclear deal. Indian Prime Minister Narendra Modi is likely to travel to Iran later this month, The Hindu reports. The Indian prime minister will likely travel there between May 21 and May 23. The visit will build on the outcome of recent trips to Iran by Indian External Affairs Minister Sushma Swaraj and Petroleum Minister Dharmendra Pradhan. The trip will be Modi’s first to the Islamic Republic since the July 2015 Joint Comprehensive Plan of Action (JCPOA) between Iran and a group of world powers on the country’s nuclear program. Since the JCPOA’s implementation earlier this year, Iran has seen relief from nuclear-related sanctions, opening up its economy. As I discussed in The Diplomat recently, during Swaraj’s recent April 2016 visit to Tehran, India, Iran, and Afghanistan finalized the parameters for an agreement, which will allow Indian goods access to Afghanistan and Afghan goods access to Indian Ocean sea lanes. The Indian External Affairs Ministry noted that the agreement “will be a strategic bulwark for greater flow of people and goods among the three countries, as well as in the region.” The Chabahar agreement has been in the works for well over a decade and Modi will no doubt be eager to make sure that it is delivered this year. The Hindu reports that Modi will visit Chabahar during his trip. He is additionally expected to visit the Farzad-B gas field, a natural gas field discovered in the Persian Gulf in 2012 that Iran has said will be available to India’s state-owned Oil and Natural Gas Corp (ONGC). Due to U.S. and European Union sanctions against Iran over its nuclear program, contract talks between ONGC and the Iranian government were in limbo for years. The JCPOA has cleared a road for India to exploit the field, which is thought to contain 12.5 trillion cubic feet of natural gas. In addition to Chabahar and the Farzad-B field, Modi will discuss more aspirational connectivity plans between India and Iran, including an undersea pipeline connecting Chabahar to India’s western coast, a transportation corridor pursuant to the Ashgabat Agreement, which India and Iran have both signed. Increasingly, India’s approach to Iran will be affected by considerations regarding New Delhi’s ties with other states in the region as well. Modi recently visited Saudi Arabia, where he signed a range of agreements expanding bilateral cooperation on defense and counter-terrorism in particular. Saudi Arabia and Iran have been rivals for decades and their disagreements were sharply amplified earlier this year when Saudi Arabia executed Nimr al-Nimr, a popular Shia Sheikh. Al-Nimr’s execution led to public protests against the Saudi embassy in Tehran and, ultimately, to the severing of diplomatic ties between the two countries. As a result of the accentuated Saudi-Iran split, India, like other regional states, will be careful in managing its relations with both countries. Under its recently articulated ‘Think West’ approach to the region, India is interested in maintaining its ties with both countries, but expanding the areas of bilateral cooperation. 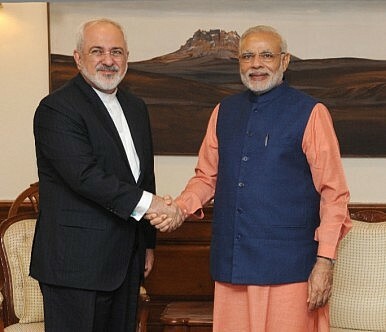 The visit by Iran’s president to New Delhi has come at a tricky time in the bilateral relationship.